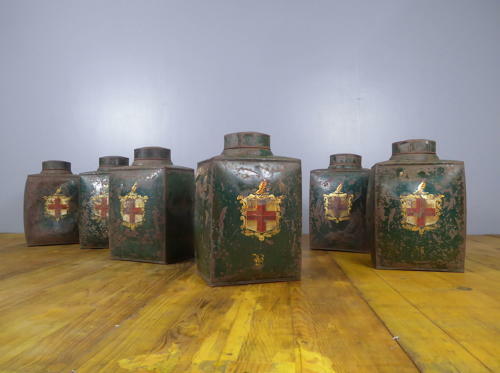 A fantastic group of six antique toleware shops tea canisters. A wonderful group of six battered tea canisters all decorated with beautiful hand painted gilt London coats of arms to the front panels & retaining their original lids. Faded Great British grandeur at its absolute best! Wear commesurate with age as pictured, untouched original condition. Dented, battered & bruised with paint loss & a few small holes here & there with most of the lids presently stuck. UK courier service available at £20 tracked & signed for 24 hour delivery.